Cat C stands for Category C and Cat D for Category D. In its simplest form, a Cat C or Cat D is used to identify cars that have been written off by insurance companies. The vehicles have mostly been written off due to cosmetic damages. The damage may have been caused by a collision, fire, flood, theft, or other reason. This does not mean that the car is no longer safe; it only means that it is not economically viable to repair the vehicle. The cost to repair the damage exceeds the market value of the car and the insurance company thus decides to write the car off rather than have it repaired. The high repair costs are due to insurance companies having to repair with original parts and at authorized centers, which drives up repair costs. 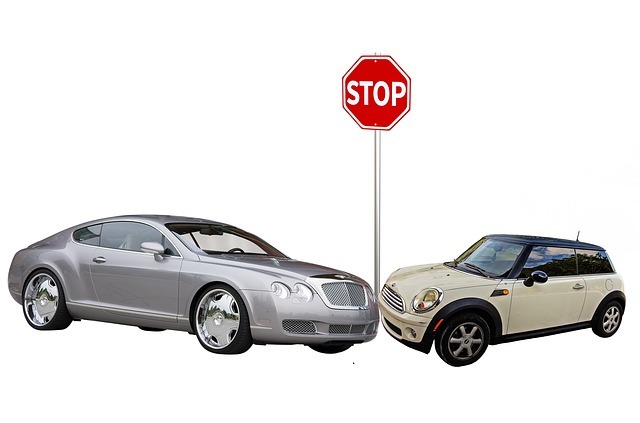 Once the insurance has made a payout to the vehicle owner, the vehicle becomes the property of the insurance company or some companies will allow the original owner to keep the written off vehicle. The vehicles are often sold to traders in order to recoup some of the lost costs, yet the sale is at a reduced price. The trader can then fix the vehicle at lower rates as no official channels need to be followed. The car is offered for sale in the used car market to realize profits for the trader. A car that is classified as Category C has enough damage that the cost to repair the car will be more than the market value of the vehicle. The car is written off and the insurance will pay out the relevant amount. It is possible to fix the vehicle but it does not make sense financially to repair it. The repairs to a Cat D vehicle will cost less to repair than the vehicle’s market value. 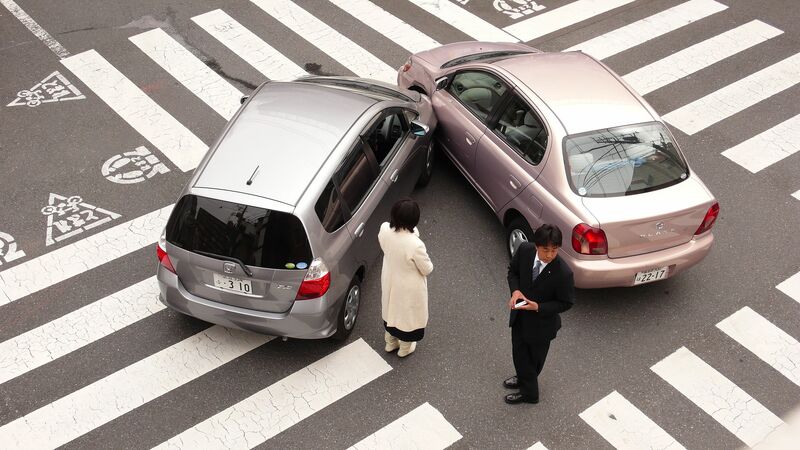 However, insurance companies use more than just repair costs to decide what classification a vehicle will get. For example, repair costs also need to include costs such as inspection fees after being repaired and the costs of providing the client with a courtesy car. These costs together may make it insensible economically to have the insurer repair the vehicle. The cost to repair a Cat C car is in excess of its market value, whereas the cost to repair a Cat D car is significant but less than its market value. The market value of a Cat C vehicle is less than it would cost to repair the vehicle; the market value of Cat D vehicles is more than the repair costs. For a Cat C vehicle, the insurer will spend less if they pay out the market value of the car than if it had been repaired; For a Cat D vehicle, it may be sensible to write the car off as the repairs cost almost as much as the market value and a profit can still be realized by the insurer. A Cat C car can be sold by the insurer to an independent dealer that repairs the vehicle at own cost but will only realize a small profit. A Cat D car sold by the insurer to an independent dealer will allow the dealer to repair the car and sell it at higher profits as the purchase price is more reasonable. Both Category C and Category D vehicles have been damaged by collkisions, criminal activity, floods, or in some other way. 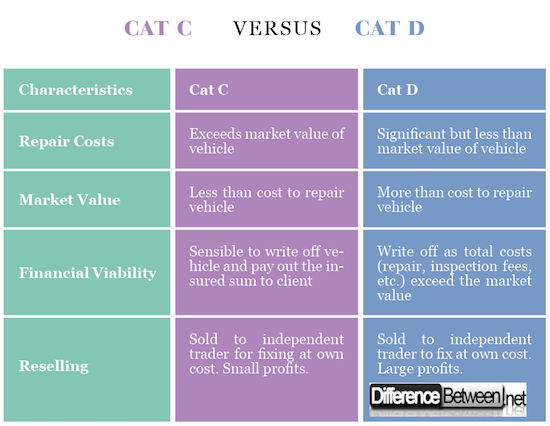 The cost to repair the damage differentiates Category C from Category D. A Cat C car’s repair cost exceeds market value; whereas the Cat D car costs less to repair than its market value. Cat C cars can be salvaged and sold at low costs after repairs; Cat D vehicles are more salvageable and sell at higher prices after being repaired. Ivannih Jooste. "Difference between Cat C and Cat D." DifferenceBetween.net. May 31, 2018 < http://www.differencebetween.net/business/difference-between-cat-c-and-cat-d/ >. Evans, Claire. “Crash-damaged cars: everything you need to know.” What Car?, July 19, 2017, www.whatcar.com/advice/buying/cat-d-need-know-2/. Cat D, C explained. Premier Cars, Online, 15 Apr. 2018. www.premiercars.co.uk/catd_explained.php. What does ‘Cat C’ or ‘D’ mean when buying a car? RAC Cars, Online, 14 Apr. 2018. www.raccars.co.uk/news/what-does-cat-c-or-d-mean-when-buying-a-car.